Over at My Two Dollars, the author is prepping for a move to New Mexico and explored the cost benefit of using a moving service rather than going the do it yourself route. After crunching the numbers he determined that it would cost him close to $2,000 to take care of everything on his own. When he contacted several moving companies he was able to get an estimate of just over $3,000 to complete the entire move, which the contractors said was likely an overestimation. In the end ,he decided to go with the moving company, a move which he claims may have been the best $1,000 he has ever spent! The do-it-yourself cost he calculated doesn't even place a dollar value on his time, which would likely make hiring the movers an even better choice. Figuring out how much your time is worth is often tricky, but in most cases you should double the first figure you come up with. 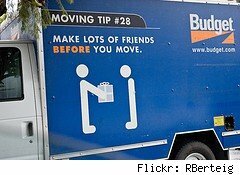 By hiring someone else to do the move you also save on the need for a chiropractor or massage therapist as well as the risk of breaking your items or the truck you rented, not to mention the possible divorce attorney fees after you and your loved one come to blows over what to pitch and what to pack.. While we have always done the moving ourselves, our moves have been cross-town rather than cross-country. After running a moving service for college students for several years, I can understand both sides of the coin. The main reason our customers chose to use the service was that the cost and hassle of doing it themselves was way more than paying for us to handle the logistics. If you have a long way to go and a lot of stuff to move then hiring a good moving company may be the best use of your money! Of course doing it yourself makes it easier to avoid any unscrupulous moving companies that might kidnap your furniture.